This winter I am teaching an American literature course that covers the period from the 17th to the mid-19th centuries: I offer one survey course each term at Elmira College. This first course in a three-course sequence introduces students to what might be called with “beginnings” of American literature. We begin with the alien voices of the Puritans, especially William Bradford, John Winthrop, and Anne Bradstreet (they are alien because of their style but even more so for their lessons), and move quickly to the odd couple of Jonathan Edwards and Benjamin Franklin. Contemporaries, both offer a high contrast as they practice the Puritan “exemplum,” a literary form that is meant to give readers an example of appropriate belief and behavior. For Edwards, whose personal narrative and sermons aim at bringing readers to embrace the sovereign power of God, literacy meant a familiarity with the Bible, especially the Old Testament. Franklin, on the other hand, was more interested in how human beings become responsible for each other and for their own understanding of morality. In a classic battle of worldviews, these two writers set the tone for the debates leading into the 18th century Enlightenment. 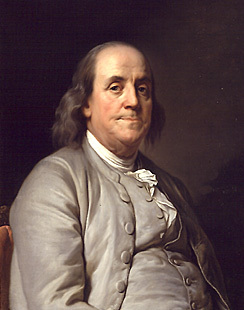 In the section of his autobiography that Franklin composed in 1784, he focused on his regimen of moral instruction and development. He lists 13 characteristics that he worked to achieve, but he emphasizes the values of temperance and humility (of humility he simply states that he will try to “imitate Jesus and Socrates” – he also has the self-awareness to say that if he ever was to gain humility, he would, no doubt, be proud of being humble). This ties to his description of his founding of the first lending library in Philadelphia in the 1730s and his description of its influence over both the society and, perhaps more so, on individual borrowers. Of all Franklin’s accomplishments, he seems to celebrate heartily the starting of the library. This is an extension of the tales from the first part of the autobiography, which he wrote for his son (at first) as an example of what it means to be “self-made.” That first section, penned in 1771 told a variety of stories focusing on books and literacy as tools to gain social and economic power. Throughout both early sections of his story (there are four parts in all), Franklin describes how books and reading became valuable to him because those in power (even a colony’s governor, for example) treated him as worth knowing either because he owned books or had a reputation as a reader. He describes how Sundays became his day for uninterrupted study (replacing public worship with private reading – Edwards would be shocked); he tells of his self-education as a reader and writer as he uses borrowed books to hone his skills and rhetorical ability; he tells of being welcomed into Philadelphia’s business community because of the knowledge he gains through reading. No doubt his early experiences as a seeker of books and a reader of all kinds of material (which started, he tells us, with John Bunyan’s Pilgrim’s Progress – its metaphor of the journey certainly influenced Franklin’s telling of his life’s story) made him more conscious of the need to make books available to a wider community. Our libraries have grown from Franklin’s early creation (though the penalties for late returns are much less a challenge for us today than at a time when books were imported from England and were tremendously expensive). I wonder, though, what he would think of how nonchalant we are when it comes to books and reading. My students, for example, find it difficult to think of a time when they could not read. They are also not always as curious or as accepting of the value of reading (and writing) as Franklin. We seem today to be much less aware of the power that literacy gives and assures (in the mid-19th century teaching a slave to read was often held a capitol crime – think of Frederick Douglass’ tale of reading and writing as an extension of Franklin’s). In an age of quick access to books (or other media), we are myopic when it comes to the worth of reading and writing. Even when we admit that literacy can offer economic value, we seem less interested in celebrating reading and writing as a means to gain self-worth. I wonder, in the end, whether the ubiquitous book (or even e-books, websites, and blogs) manages to camouflage the importance of reading in our lives. We take so much for granted. And, especially (perhaps) libraries. Franklin would not be happy with us. This entry was posted in Uncategorized and tagged Benjamin Franklin, literacy, social power by ccld. Bookmark the permalink.